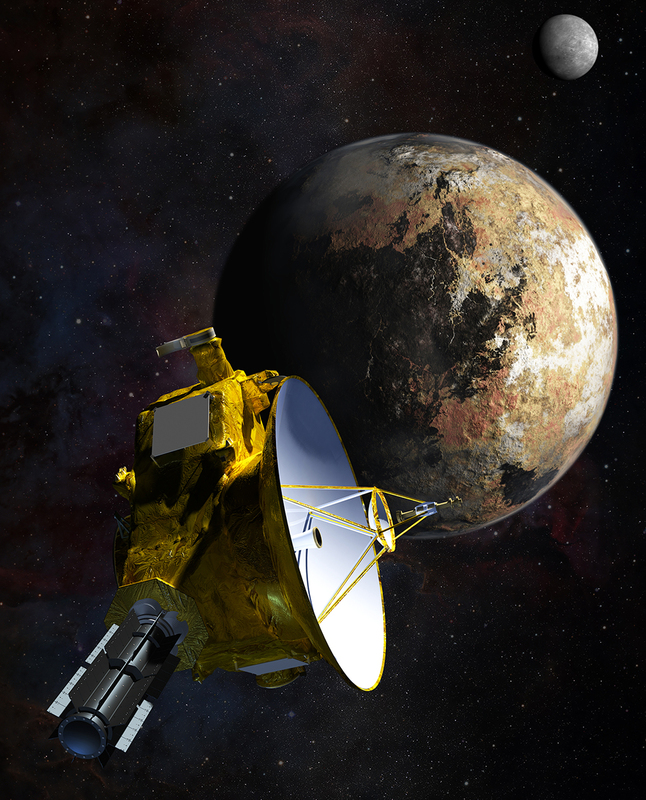 NASA’s New Horizons Spacecraft Begins First Stages of Pluto Encounter. Artist’s concept of NASA’s New Horizons spacecraft as it passes Pluto and Pluto’s largest moon, Charon, in July 2015. The next flyby target for NASA’s New Horizons mission. This binary concept is based on telescope observations made at Patagonia, Argentina on July 17, 2017 when MU69 passed in front of a star. New Horizons theorize that it could be a single body with a large chunk taken out of it, or two bodies that are close together or even touching. Pluto photographed by the LORRI and Ralph instruments aboard the New Horizons spacecraft. This color photograph made using Adobe Photoshop CS5. The spacecraft is carrying the ashes of the scientist who discovered Pluto, Clyde Tombaugh. Tombaugh died on January 17 1997, nine years and two days before New Horizon’s launch, but one of his final requests was for his ashes to be sent into space. New Horizons, which captured incredible images of Pluto in July 2015, was powered down in April to conserve energy as it travelled through the Kuiper Belt, a vast region of icy debris which encircles the Sun and planets, also known as The Third Zone. On September 11, the spacecraft will awaken for its 16 month journey to MU69, an ancient object which is thought to be one of the early building blocks of the Solar System. We are very likely going to a primordial binary in the Kuiper Belt, a four-billion-year-old relic of Solar System formation and an exotic building block of the small planets of the Kuiper Belt like Pluto. It may even be a swarm of smaller bodies left from the time when the planets in our solar system formed. New exploration awaits us. It promises a scientific bonanza for the flyby. When it launched in January 2006 Pluto was still a planet, but just a few months later it was downgraded to a dwarf-planet or “plutoid” and is now known officially as “asteroid number 134340”.